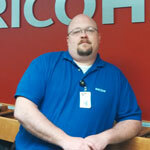 Ricoh is PCSSD's partner providing copiers and copier service and support. Our goal is to offer a superior product and world-class service, while saving the district money. Our team prides itself on exceptional quality equipment and fast, courteous training and support. Log in with your username (without the @pcssd.org) and your email password. All Black/White copy/print jobs more than 400 pages should be driven to the PCSSD Print Center at the Central Office. Any Color copy/print job that exceeds 50 pages must be presented online to the Print Center for production. All jobs over 20 pages should be duplexed. Color devices should be set as default to Black/White. Printing items from email should be highly discouraged. Printing from Internet when needed should only be in Black/White. Any job being considered to be outsourced must be presented to the Print Center first for evaluation prior to submitting to an outside printer. Any sports related or club related print jobs should be presented to the Print Center for a pricing evaluation. Copier Help Desk Hours of Operation: Monday - Friday 7 a.m. – 4 p.m.
Brian is your first point of contact to report copier / MFD service issues or request supplies.